While the cost of baby gear, clothes, and diapers adds up quickly, there is also money to be made with baby items. For all three of my children, I've bought quality baby items second-hand for less than half of their retail price, used them, and then resold them for what I paid (or more!) once I was done using them. 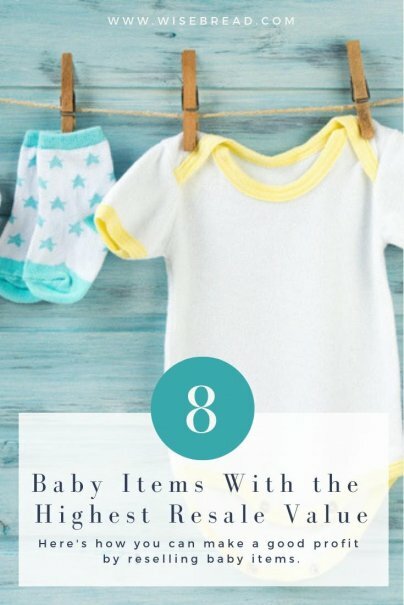 This method has allowed me to have everything on my baby list and lower the cost of having a baby. I once found a baby Burberry outfit for $0.99 at the thrift store. I resold it within 24 hours for $75 on eBay. The right baby clothes can fetch a pretty penny. Look for popular brands like Baby Gap, Janie and Jack, Gymboree, and OshKosh for less than $1 a piece to resell. Selling a lot of the same brand in the same size can earn you more money than selling each piece separately. Boutique brands like Hanna Andersson, Naartjie, and Kickee Pants sell for even more when they're in sets and in excellent condition. New parents are more likely to spend more money on their baby's first and second Halloween costumes than the ones that follow, because those are exciting ages to celebrate Halloween in something that's brand new and extremely cute. Parents are willing to spend a lot of money on name-brand strollers, especially if they're double or triple strollers. Look for brands like Bugaboo, Baby Jogger, Britax, and BOB strollers, since they hold their resale value well. Potential sellers are very interested in the year a stroller was made, so be sure to stick to recent models to make an easy sale. Along with strollers, stroller accessories are also a hot item. Brand-name trays and attachments are easy to store and can fetch a decent price if kept in good condition. The key to cashing in on baby specialty items is to stay on top of baby trends. Specialty baby items like a DockATot baby lounger or Owlet baby monitor are at the top of many baby must-have lists at the moment. If you can find these items for 70 to 90 percent off their retail value, then you can make a quick profit. Most parents are desperate to sell large baby gear for next to nothing because it takes up too much space in their home or garage. You can find walkers, bouncers, high chairs, Bumbo floor seats, and more for $3–$5 each at yard sales and local online sales and flip them for $25–$60, depending on the quality of the item and brand. Baby carriers like Ergobaby, TwinGo, Tula, and the Solly Baby Wrap all resell well. These baby carriers in specialty designs can also earn more money than standard colors. When looking for brand-name carriers, be sure to stay up-to-date on the newest models. For example, Ergobaby released a 360 carrier, so parents can carry their babies forward-facing safely. This means there is a greater demand for this model than Ergobaby's older models.